Passion has a strange way to connect people. A few weeks ago, Michael called me and talked of an older gentleman living in Guelph, ON who wanted to get in touch with me. 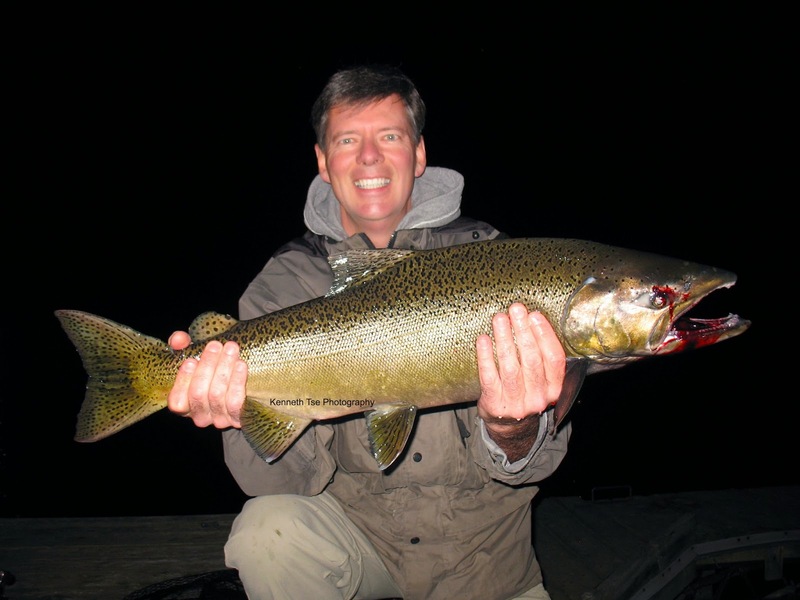 George, a retired professor, is an accomplished species angler with 628 species on his list. 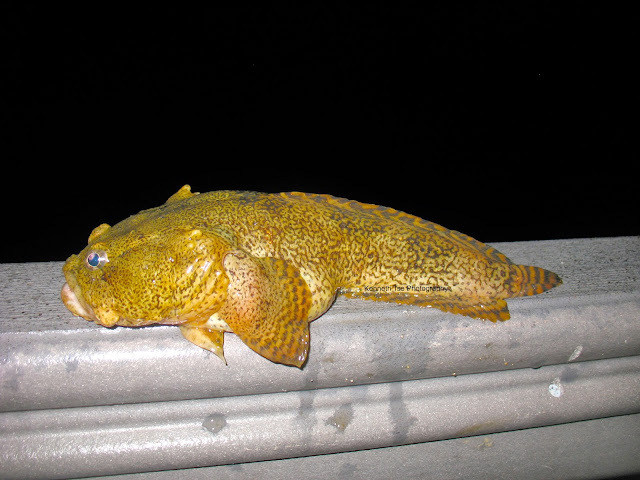 He was delighted to find a local species angler when he found my blog. There were local species that I've caught that he has yet to add, and likewise I have species that George can help me add. After a few enlightening emails, we found a good weekend to meet. The goal was to help George add a few micro species. During the car ride, George told me tales of fishing in Vanuatu, Manzatlan and Thailand, and my eyes feasted upon albums containing species which some I've never seen! It was simply astonishing! 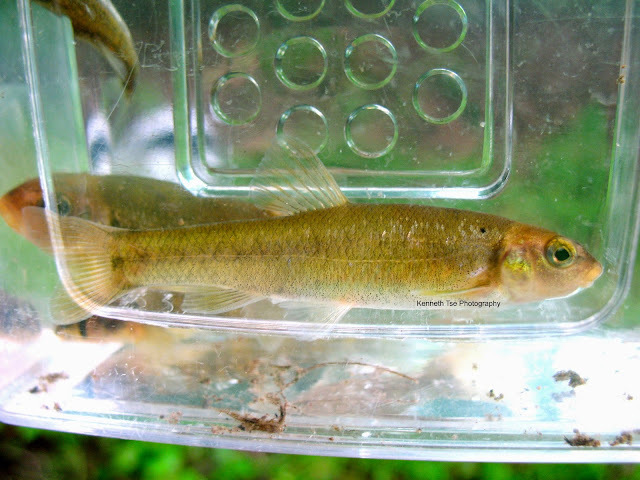 Our first location was a small pond that, as far as I know, contained only Northern Redbelly Dace. A month ago, this pond was very fishable and schools upon schools of spawning dace were easy to catch. 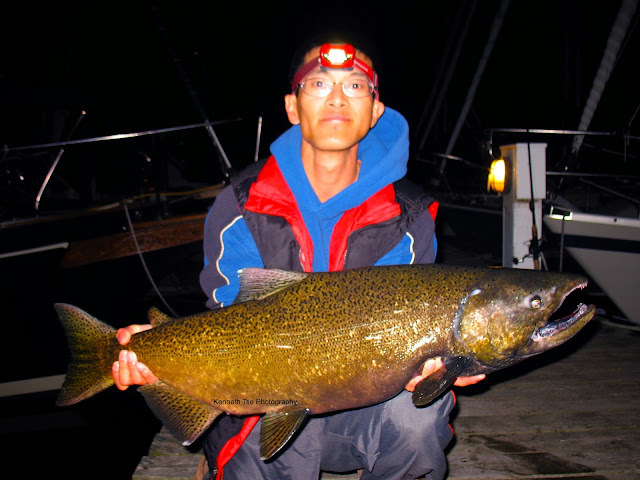 However, late July meant a weed choked location where my previous fishing location was completely unfishable. Instead, we explored a dock over deeper water where we did find some small dace. The smaller dace were difficult to hook, but we soon found a school of bigger dace hanging just within reach of my 8-foot tenkara rod. It took a little adjustment with timing before George added a Northern Redbelly Dace to his list! Just before we left, I spotted a strange little orange fish. With a bit of patience, it came within each of our net and we found out it was a strange colour morph of a Northern Redbelly Dace. 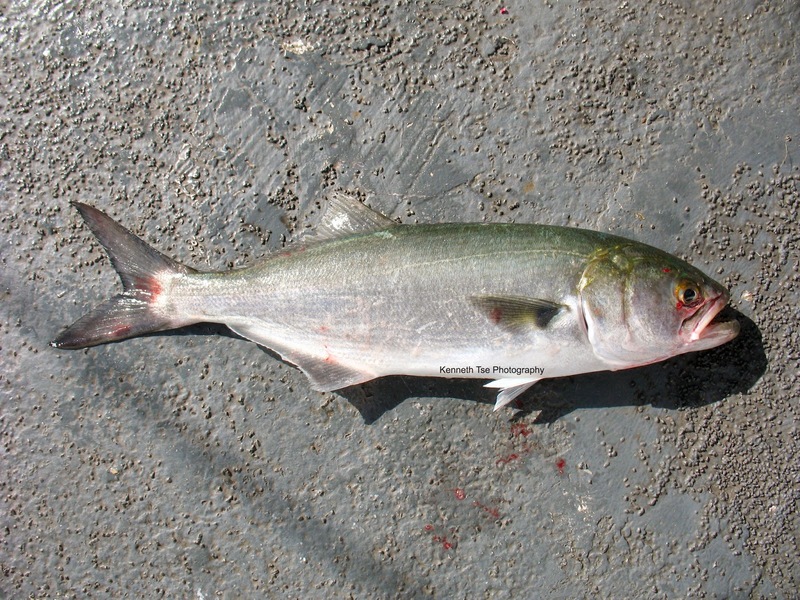 There was a normal colour dace of similar side within the same scoop of the net. Finding one golden morph was rare, but there was a second golden morph swimming around as we took this picture! Since mission #1 was complete, we moved to Location #2 where we would wade the stream for a Blacknose Dace. This stream yielded Longnose Dace for me three weeks ago. 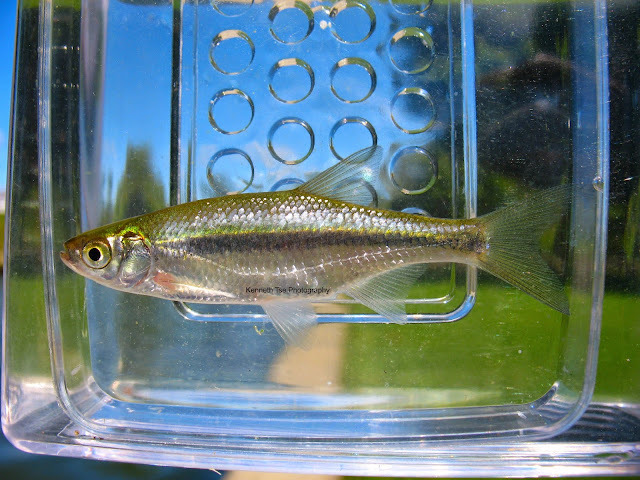 I caught one Blacknose Dace, but I was confident that there were many more. I have also caught Johnny Darter further upstream. 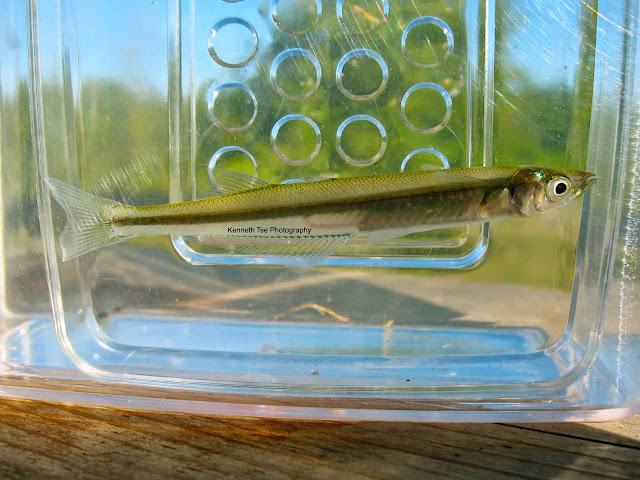 While I searched upstream for Johnny Darter, George quickly caught his first Blacknose Dace. When my search came up negative upstream, I waded downstream. I did see three juvenile Johnny Darter downstream but these were much to tiny to target with hook and line. 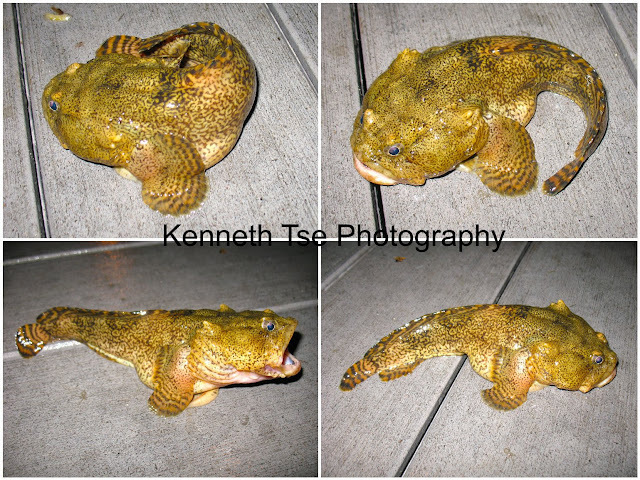 I also spotted what appeared to be a sculpin, however, I did not have my tenkara rod with me. As luck would have it, just as I returned to George, I spotted a Tadpole Madtom scurrying under a rock. By the time I returned with my tenkara rod, the madtom has left. It was good to know they can be found in this stream. I'll have to come back to look for them! Mission #2 accomplished (sans Johnny Darter) and a very short relocation later we arrived at Location #3. Disappointingly, the little culvert that had yield Brook Stickleback for me was reduced to a thread of slow flowing water too shallow to hold much of anything. Beside this culvert was a pond that has a population of Bluntnose Minnow and Fathead Minnow. George has not catch a Fathead Minnow so he wanted to try the pond, even in its weed choked state. 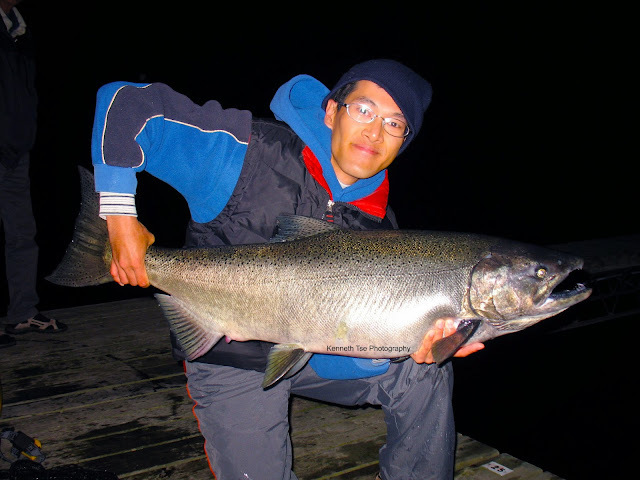 We did find a rim of clear, open water that was very fishable. It was here that we found many small Brook Stickleback. 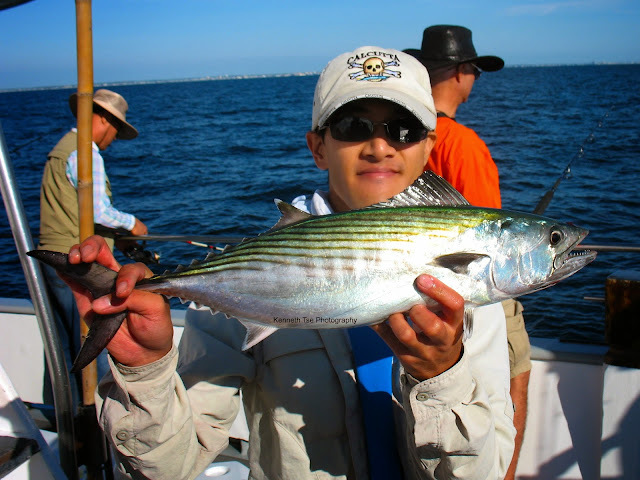 Although they were very willing to bite, almost too willing, their small size made them extremely difficult to hook. While I was poking around, I saw a little movement on bottom. Looking more intently, I soon spotted a slender shaped darter on the gravel bottom. I thought this might be a Johnny Darter since they can live in these swampy areas as well as slower portions of the stream that was connected to this pond. I started presenting the bait to the little darters, had many refusals and it was a tough time getting away from the sticklebacks. But finally, one moment of fortune fell upon me as I got the bait in front of a willing darter before the sticklebacks could find it. The darter greedily took the bait in its entirety into its mouth and I lifted the hooked darter onto shore. Immediately, the darter appeared very different from a Johnny Darter. I had a hunch that this may be an Iowa Darter. 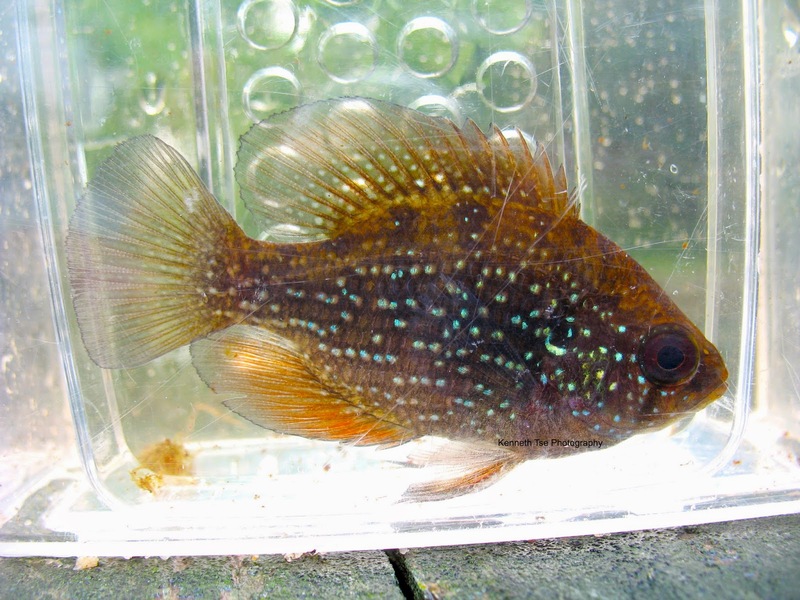 The habitat was a perfect fit and the overall shape and colouration matched very well with the Iowa Darter. Once we consulted the guidebook, I was pretty much convinced. 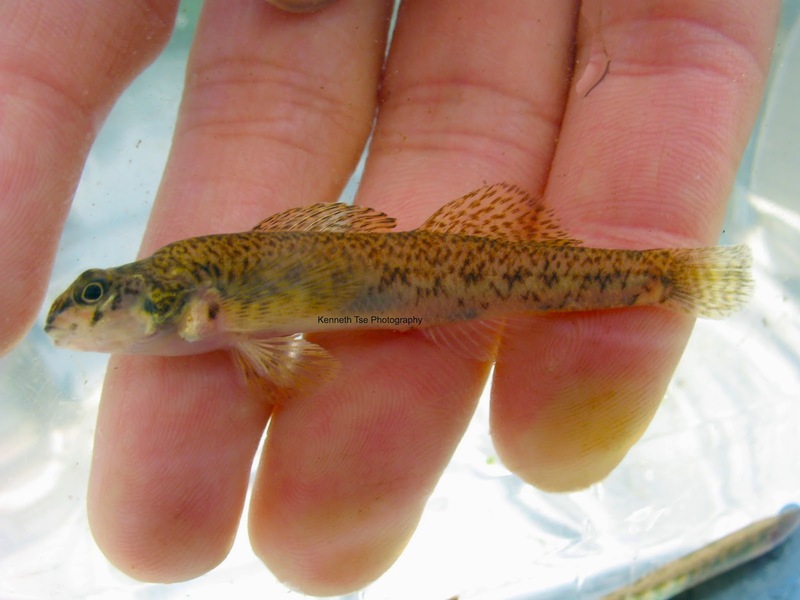 On a day I was only expected to have a chance at Mottled Sculpin as a new species, I found a lifer Iowa Darter! 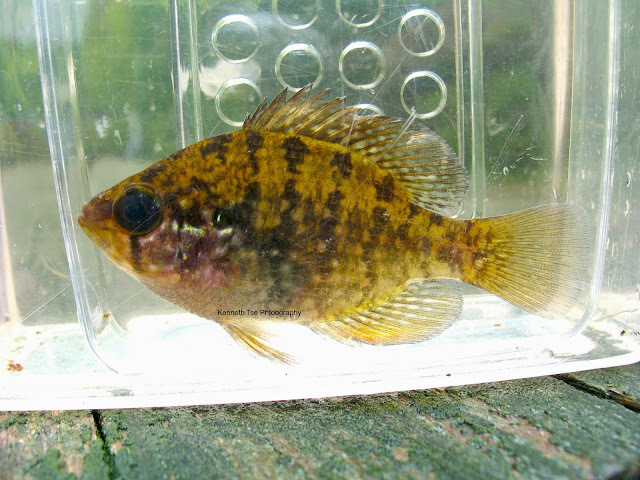 Iowa Darter (Etheostoma exile) - Species #394! We had both George's and my Iowa Darter in the same micro photo tank. Here is the Iowa Darter that George caught, which was just slightly larger than mine. 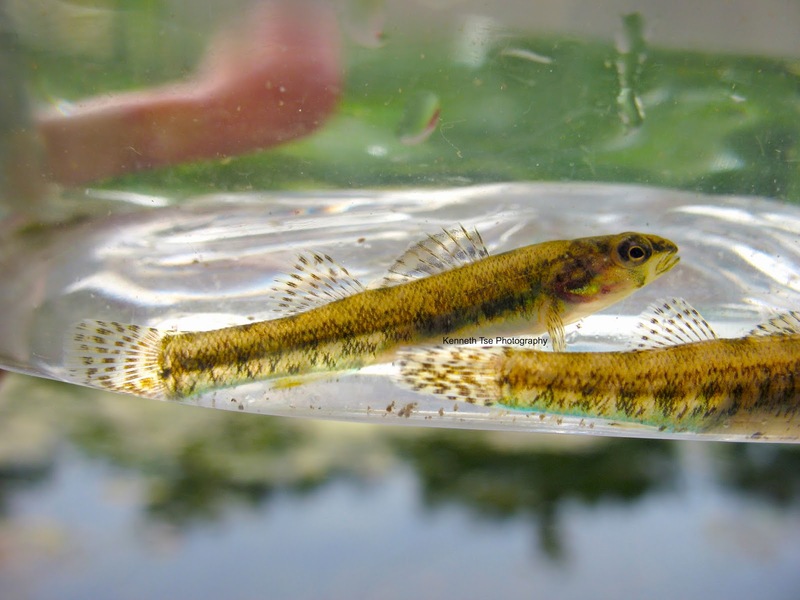 There were discussion whether these were Least Darter or Iowa Darter. 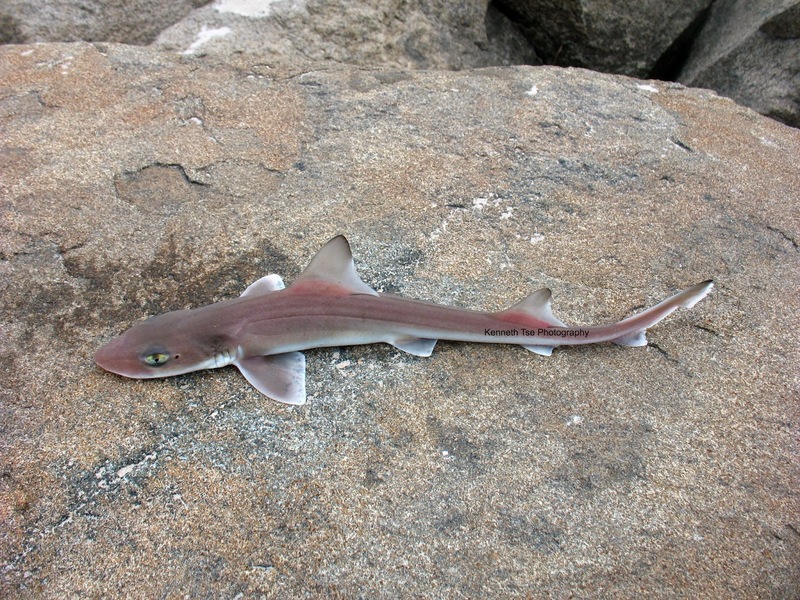 People often looks at shape and colour and forget about other distinguishing characteristics like fin spine and ray count. 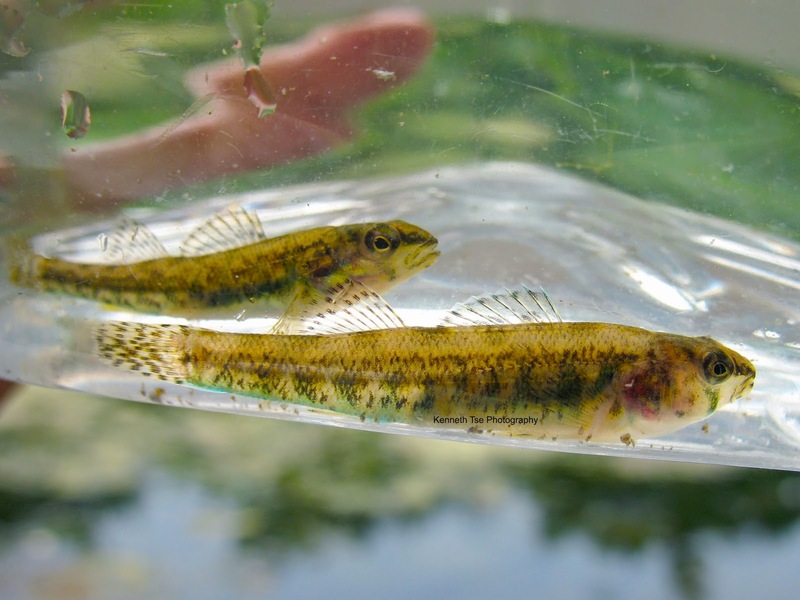 In Iowa Darter, the first dorsal fin usually has 9 spines (but may range from 8-12, with females having the greater count). In Least Darter, the first dorsal fin usually has 6 spines (but range from 5-7). Thus, if you were to count the first dorsal fin spine, you can clearly tell that these are Iowa Darters. There were a few of them in the area, which allowed George to catch one soon after. The second slightly larger darter in the picture was the Iowa Darter that George caught. We were very pleased by this surprise catch! We couldn't find any Fathead Minnow, so I promise George that we'll try for them next spring when the pond is more opened. I know that the stream crosses the road just a little distance away and there is a culvert where we could fished. We relocated to the culvert to find a nice rocky bottom and a lot more depth. It was very evident that there were many Brook Stickleback and ever a few darters on bottom. The culvert had steep sides. Since it was raining lightly, we chose to forgo the risk of a fall trying to get down to the bank. However, the culvert was at least 7 feet above the stream. My 8-foot tenkara rod can barely reached down. We had to lie down on our belly to reach the fish. Trying to hook and land any fish was difficult in such situation. George hooked a few micros but they would wiggle off the hook as the fish broke the surface of the water. 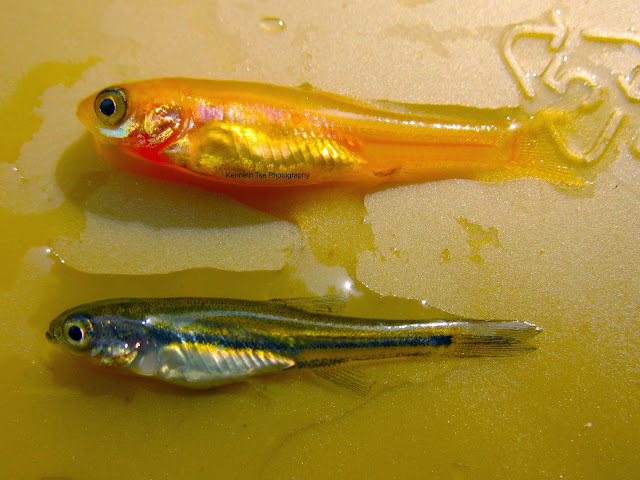 Like before, the stickleback was quite a nuisance since they would swarm the bait before the darter could be tempted. 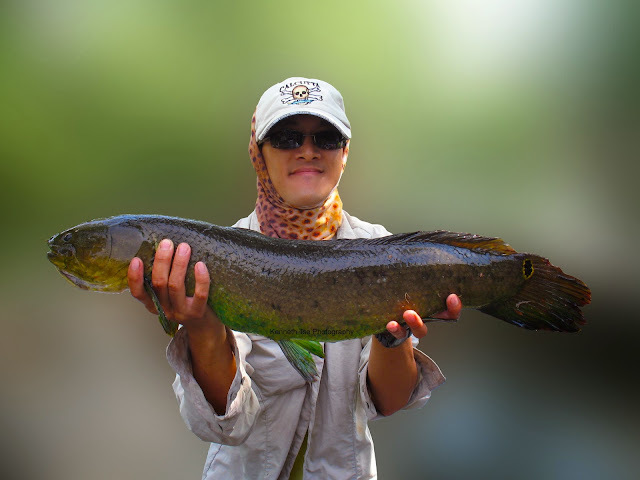 With a lot of determination, and quite a bit of tolerance, I finally hooked a darter. We finally had a confirmation that Johnny Darter lived here. This gave George some renewed hope that the Johnny Darter could be caught. Attempts after attempts were made. Although the Brook Sticklebacks were ravenous, George could not get the hook into one of them. We had the darters in the micro tank and the water was getting a little warm. So I took a little hike to get down to the stream to change the water to keep the little darters alive. I spent time to get a few more shots of the darter when George asked me to get his long handled micro net. While lifting up a hooked fish, the line was wrapped around an overhanging branch. The fish was still hanging on the hook, but George wanted the security of the net under the fish while we try to sort out the line. 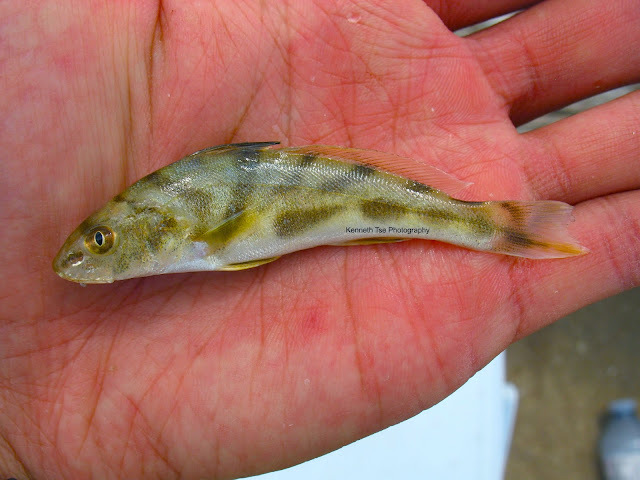 I hastily grabbed the net and immediately saw that it was a Brook Stickleback. The stake was not even higher now. But we finally got the net under the fish, the line untangled, and the Brook Stickleback safely in the micro tank and onto George's list! 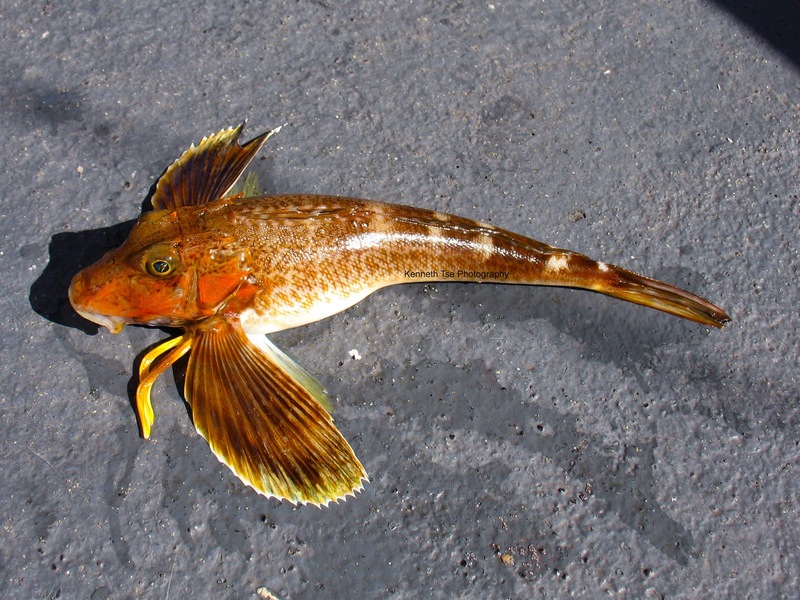 We tried for the Johnny Darter over and over for quite a while after. But as the afternoon wore on and the rain getting more intense, we simply had to end the hunt. There are other areas where Johnny Darters can be found, so we'll put another effort for them another day. While lying down fishing for these 1" fish, George said that most people will not understand why we do it. It definitely take a kindred spirit to appreciate the efforts put into species hunting. We were both glad to have found each other and I'm sure this is the start of many future adventures together! 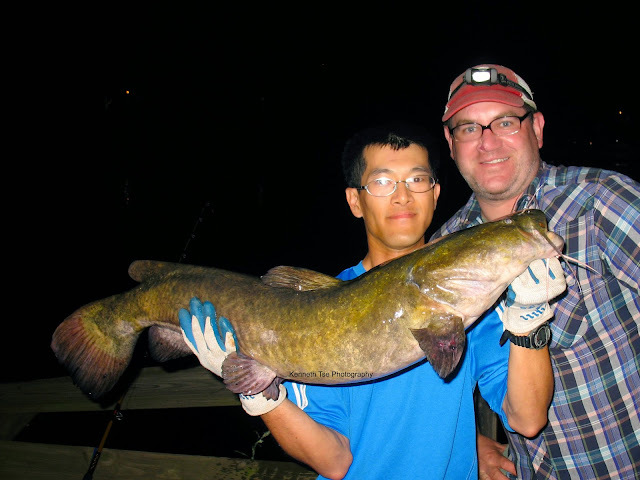 After last weekend's fun with Bowfin and Common Carp, I wanted an encore. 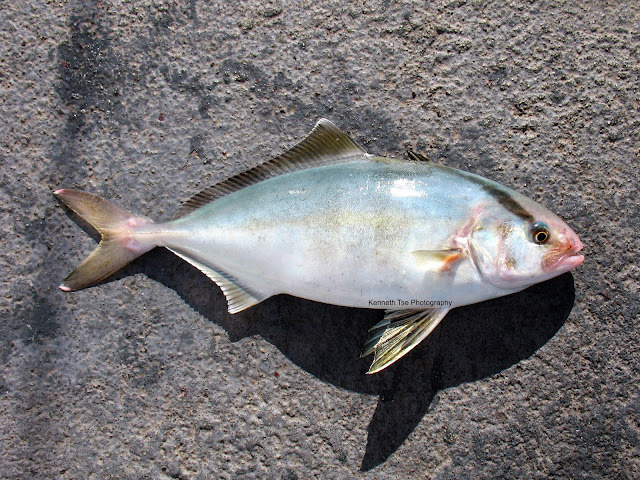 Fishing was tough, but if you pay attention, you can find some actively feeding fish, even in midday. However, they were feeding in all the worst areas. 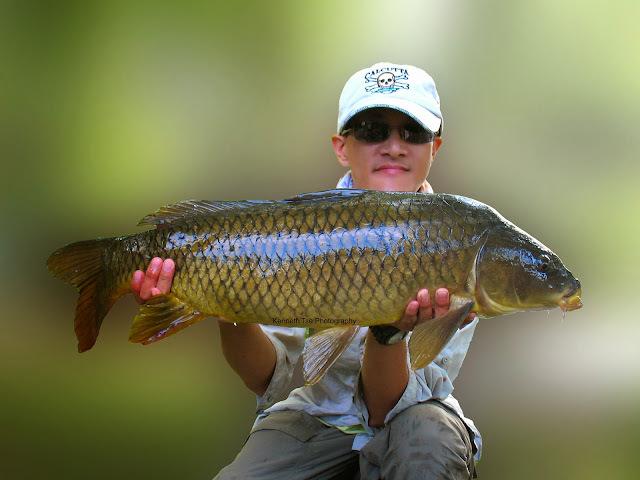 It took a lot of work to get carp to bite, but it took even more work to try to bring them to hand. The final stats was 3 carp landed out of 12 hooked. These freight trains were simply unstoppable with the snags surrounding me on all sides. Some would run under fallen trees as soon as they were hooked up. I may get 10 seconds if I was lucky; it was either turn them or lose them. If I force the issue, I had either pulled the hook or snapped the 15lb mono. If I tried to be patient and fight them out, they eventually find themselves deep into the fallen trees. Just can't win. I started searching in a back bay and found carp feeding very shallow. They were quite bold since they were protected by two large downed trees. 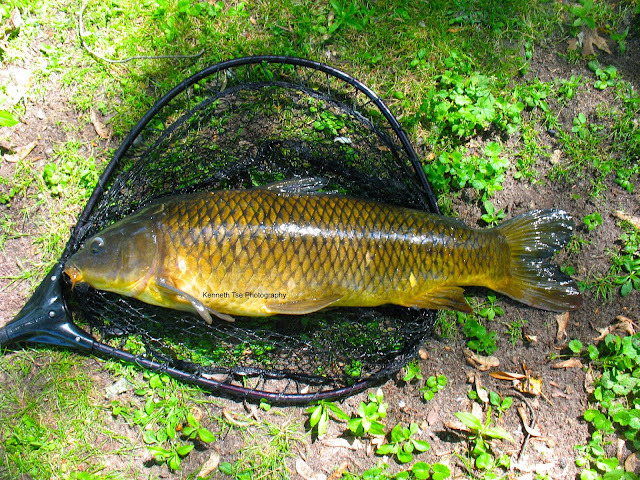 After losing 4 carp to various aforementioned reasons, I managed to tame this 28" model. Continuing my search, I came upon a trio of post-spawn bass still hanging out together. I pulled one aside for its photo session before the other two moved on. There were some carp feeding near a dock. But under the dock was a lot of fallen branches plus an anchor chain. Fish were fairly easy to trick, but they knew to run under the dock as soon as there was danger. Another 2 carp lost, and a little Bowfin tried to sneak up on me. 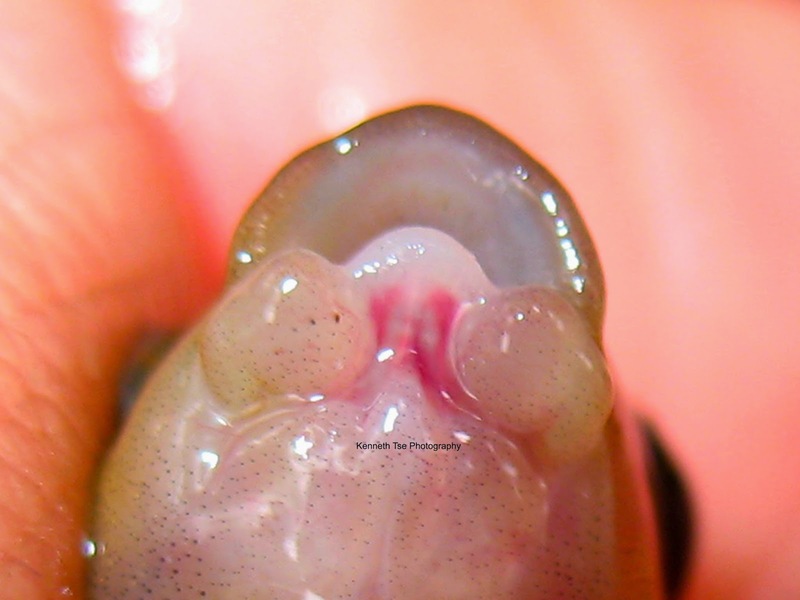 I taught another Bowfin not to eat nightcrawlers. 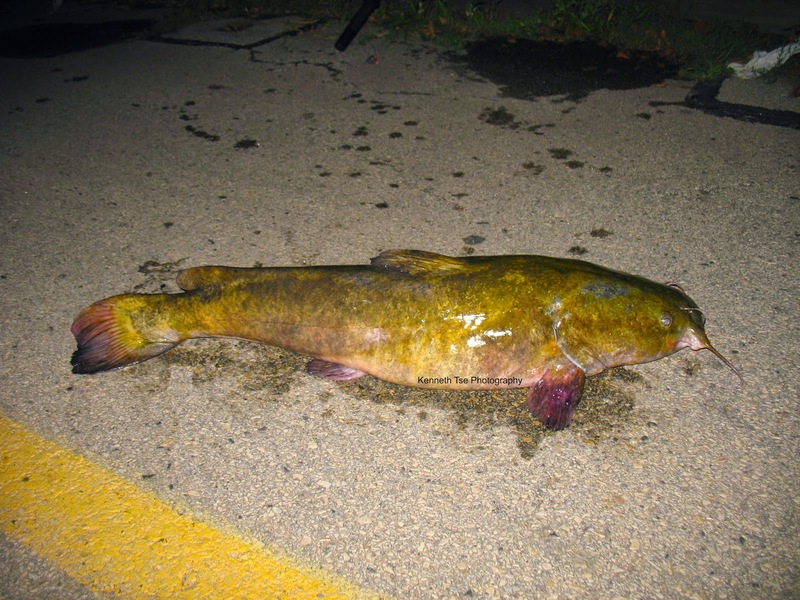 I would later see the same Bowfin and tossed a nightcrawler to it again. It appeared he learned his lesson since I've never seen a Bowfin turn tail with such speed LOL. 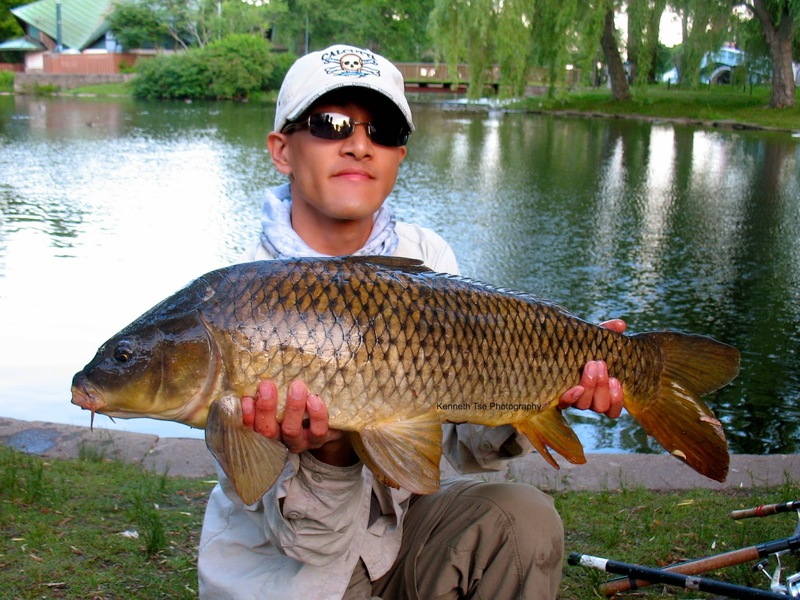 It seemed all the hungry carp were in the back bay. They were again feeding very shallow and not shy at all...until I broke off 2 of them and the remaining fish became very cautious. A lot of patience later, one finally made the mistake. This time, I quick pumped the rod at the start of the run and managed to turn the fish before it even considered running into the fallen tree that had claimed the last two fish. Returning back to the dock, I lost one more to the dock but finished the day with this little one. 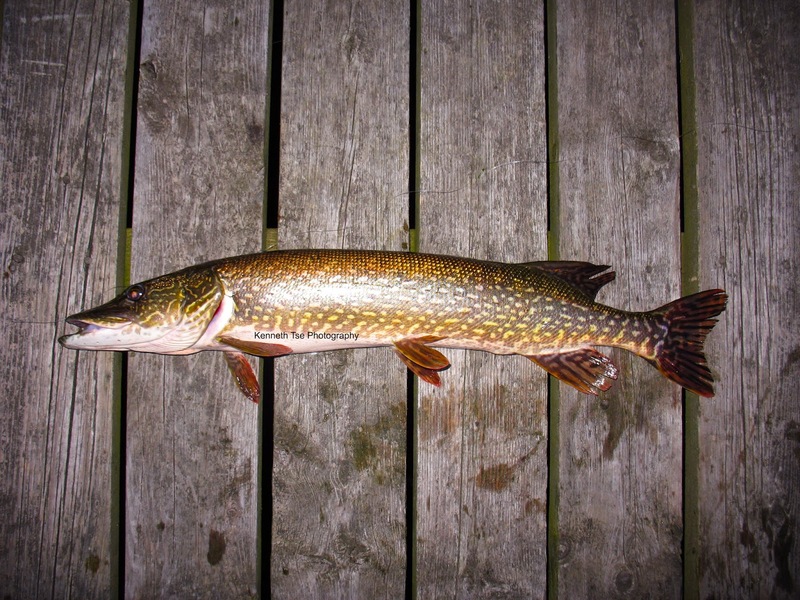 Each year, Canada designates one week in the summer as National Fishing Week. 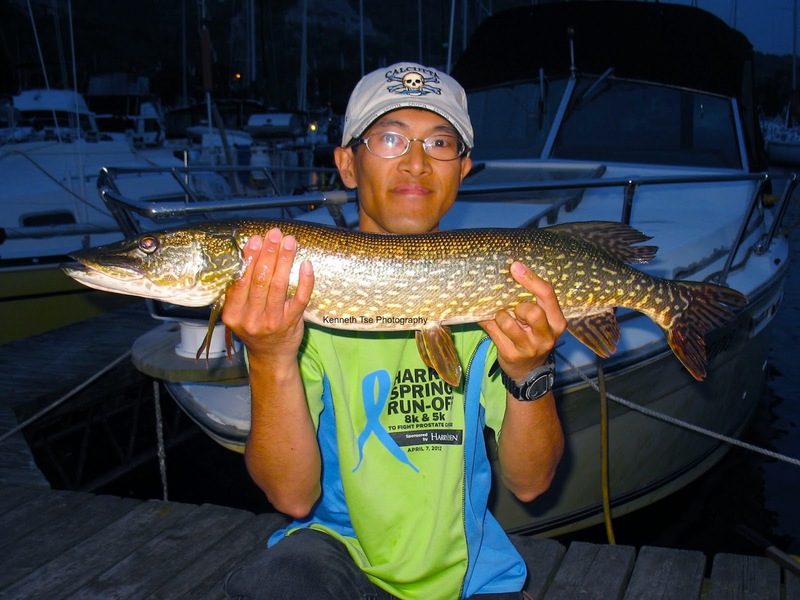 During this week, the province of Ontario designates the period as a license-free fishing opportunity to encourage the public to experience fishing for the first time. 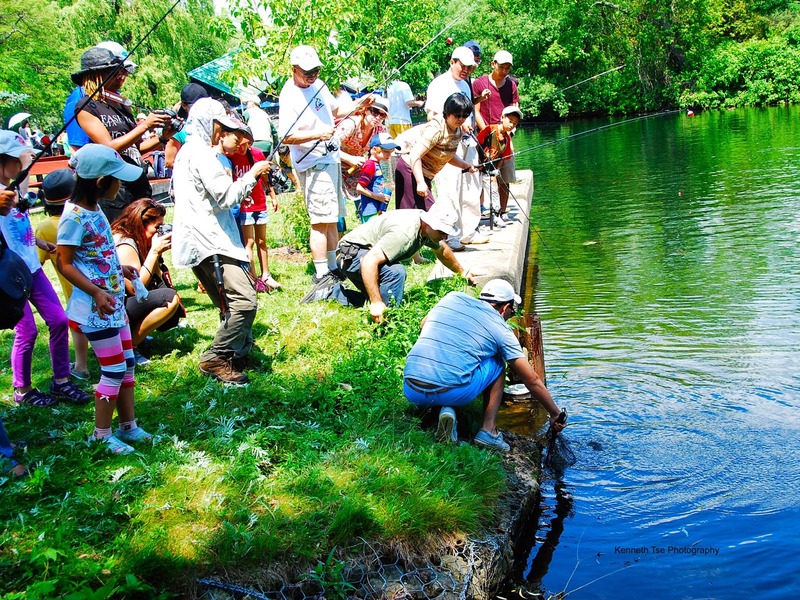 As part of the initiative, many agencies and fishing groups set up Family Fishing Day events to encourage participation, as well as to provide an avenue where experienced anglers can teach first time or novice anglers how to fish. The Toronto Urban Fishing Ambassadors had participated in these events annually since its inception. This year was not different and many members attended the weekend events. 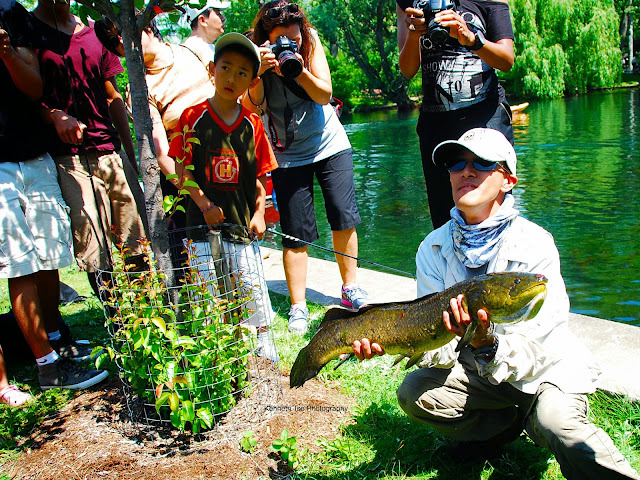 On Sunday, the event was held at the Toronto Islands. Wishing for a little bit of fishing time before teaching kids, a few of us arrived a couple of hours early to search for bass. I had my mind on either Largemouth Bass or Bowfin, so I was rigged up with a whole nightcrawler to start the day. Not too long after searching, I found a 3lb Bowfin slowly stalking prey. I careful cast and placement of the worm resulted in an immediate response. 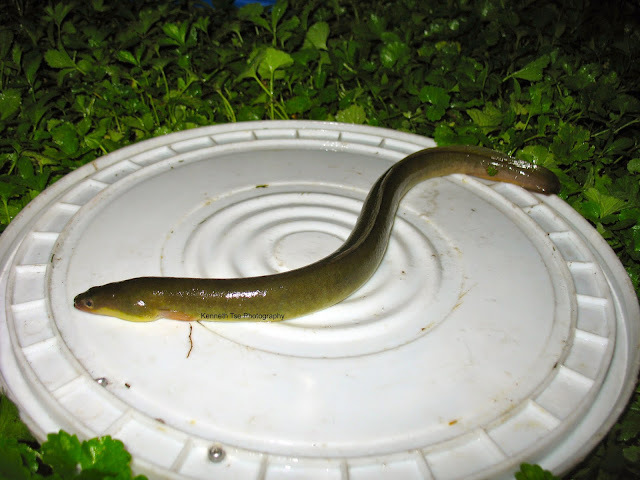 The Bowfin swam forward cautiously and strangely placed its chin over the worm. It sat here for a couple of seconds as I was contemplating whether the fish had refused the worm. But then the fish inched backwards, pointed its nose down, and gulp! That was all we found before the kids showed up. The event started at 10am, but the number of kids trickled in slowly. The kids and parents gathered for a briefing where they received a bit of information on safety, the kind of fish common to the area, and simple instruction on how to fish. Even so, many kids and parents often required our help to set up their rods and reels, tie up line, bait hooks and casting instruction. While I was walking around to offer help, I noticed a long dark shape deep in the weedbed. All I saw initially was the ribbon-like dorsal fin. 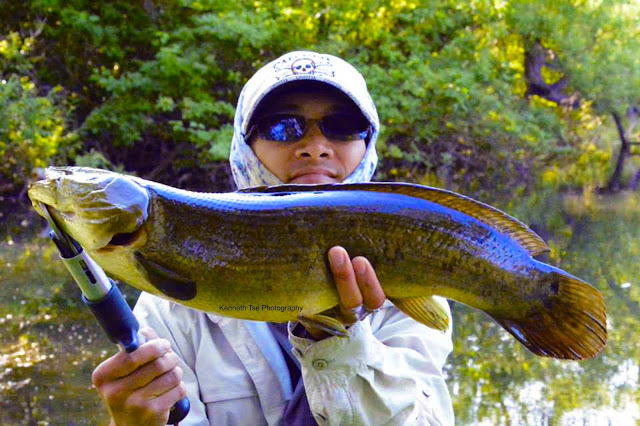 Yes, it is a Bowfin! I thought about telling people to look for the fish, but having so many novice anglers around, everyone would want to cast to the fish. I truly would be happy if they had caught it, but since many people cannot even cast properly, many of them would end up tangling their lines or each other lines. The ensuing chaos would take a long time to sort out. Even if they manage to cast near the Bowfin, a sloppy cast would send that fish out of the area. Instead, I ran to grab my own rod and quickly baited up a nightcrawler. Everyone was wondering why I was running so fast...and all I said was "Bowfin!" It was cool to be able to catch and show kids the amazing fish that is the Bowfin. They got to touch it and see its beautiful colour. Ron took the video and edited it. A lot of the interaction between me and the kids was cut out in the video, but I think you want to see more of the catch than the other "stuff". It was maybe an hour later when a few moms and their daughters asked me to help teach the girls how to put worms on the hook and how to cast. One by one, I showed them how to cast and when they developed a better cast, I moved on to help others. Walking my way back along the shoreline, one of the moms said the reel could not turn. I saw the lines had wrapped under the spool and there were loops of line all tangled up between the rod guide and the bail arm. I took of the spool, unwrapped all line around the shaft, cut all the knotted line and retied the entire rig. Just as I was going to make a cast for them, I noticed another Bowfin, in the same area, stalking sunfish in the deep weeds. So instead of the little chunk of nightcrawler that I had put on the hook, I replaced it with a whole nightcrawler. These shorter rods were more difficult to cast, but I had experience on my side so I was able to swing the worm silently and accurately to the fish. 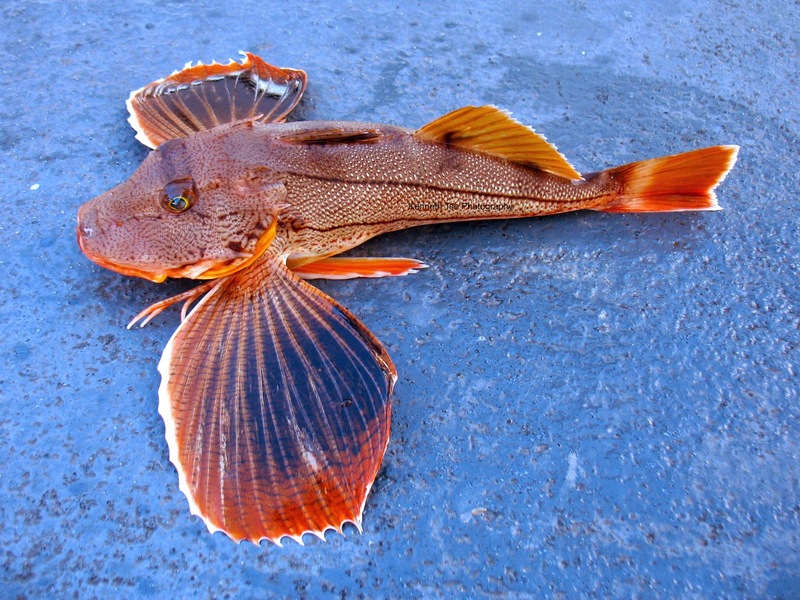 However, this fish turned out to be pickier, but eventually persistence paid off! I tried to hand the fish off to the kids, but none wanted to take the rod. To be honest, this fish would give them a handful since it was pretty strong, the rod was less responsive, and the drag was quite jerky. I had to back the drag off and thumb the spool most of the time. Here are some pictures. That's Bowfin #3 for me on the day. Awesome! The Family Fishing Day event ended at 1pm, but it was already 2:30pm when we had taken down our booth. A few of us decided to stay and fish longer. I still had my mind of Largemouth Bass and Bowfin so I stalked the area twice but found no further Bowfin. I saw a mom and her son trying to fish, but not catching anything. At this point, I had a little hook fishing chunks of nightcrawler for the sunfish. 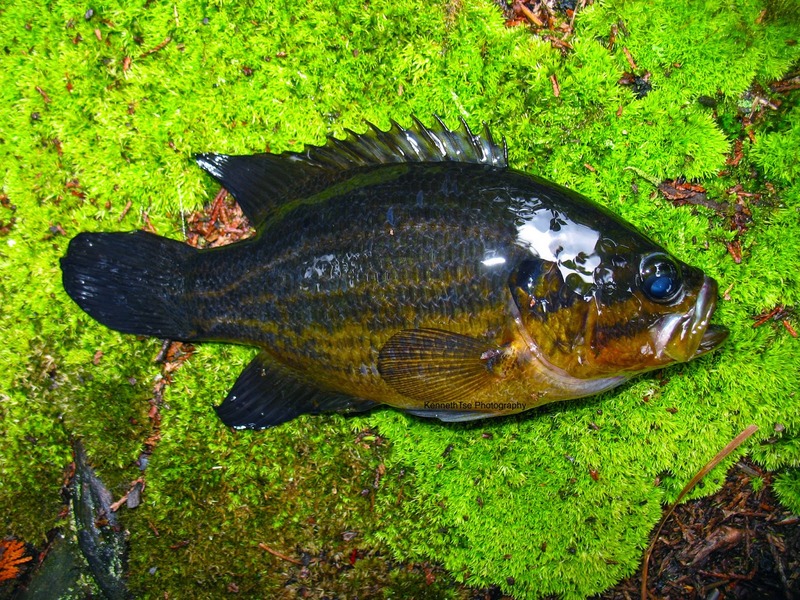 I was poking the worm underneath a rock when a Rock Bass came darting out. It was about 10" long and the mom saw that I was doing well so she came to ask for help. They got the rods from the Family Fishing Day and was there earlier, but her son hadn't caught a fish. 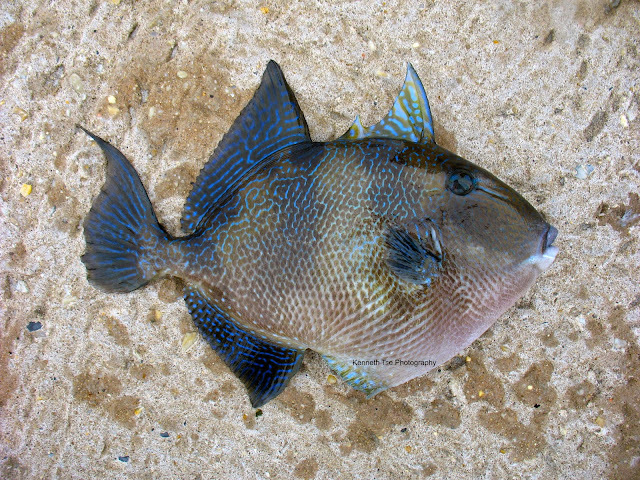 In truth, the hooks that were provided were too large for the sunfish. I switched out the large hook and replaced it with one of my #14 hooks. After baiting up with a small chunk of nightcrawler, it took no time before her son caught a Pumpkinseed Sunfish. We caught a few more sunfish before they became shy and I parted ways with them. By now, it was later in the afternoon. 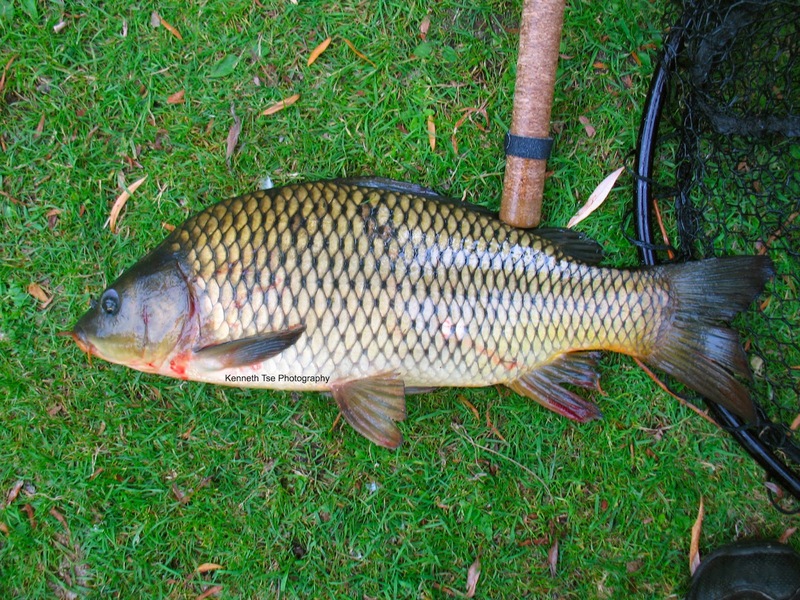 During midday, the Common Carp were sunning and not active at all. But now, I started to see a few carp milling on bottom. It's time to focus on them. I tried to fish with the guys for a bit but action was slow. However, just 20 feet to our right, a young guy hooked into a nice carp but he was having trouble controlling the fish. 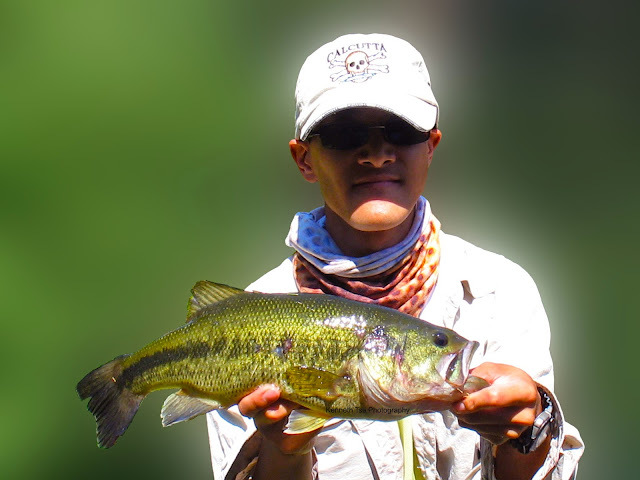 He was using a telescopic rod with fairly light action and a reel that could use a better drag. 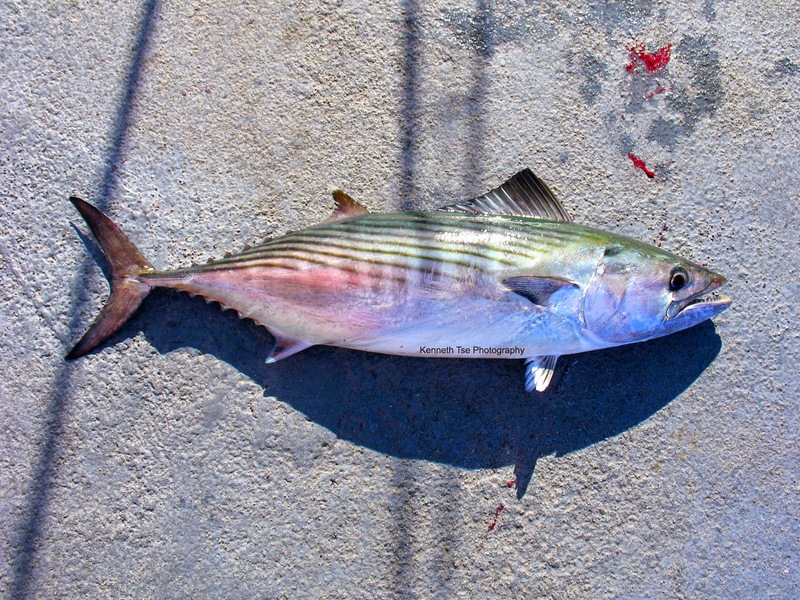 He set his drag too light and all he could managed was to reel against the spool as fish was taking out more and more line. I tried to instruct him to use the pump and wind to gain some line back, but his inexperience was obvious...and he was getting spooled...and his fish was taking him toward a series of overhanging branches. So I finally asked if he needed my help and I found myself trying to turn the fish before it got too deep into the snags. It took quite a bit of finesse to turn that fish. While I was thumbing the spool to slow the fish down, I also had to mind the light telescopic rod. The drag was rather jerky so I had can't put too much pressure on it. 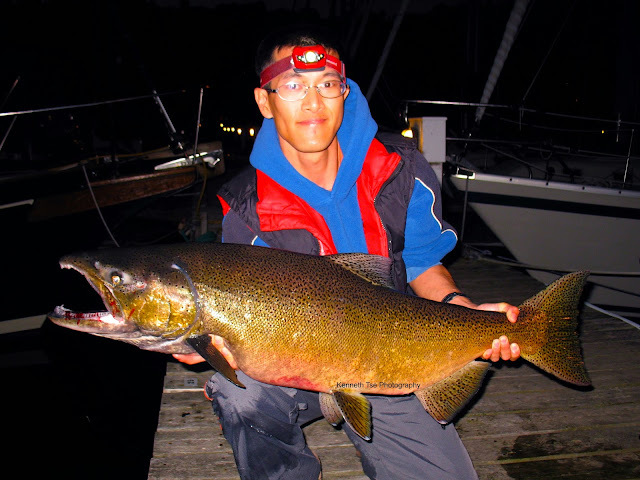 By lowering the rod close to the water, I was able to pull the fish out of the snag and prevented the line from fouling up as the fish ran under the overhangs. After a few tense moments, I finally gained back a lot of the line and had the fish in the clear. I handed the rod back to the guy and let him finished the fight while I grabbed the net. It still took another 3 minutes before we had the fish in the net. 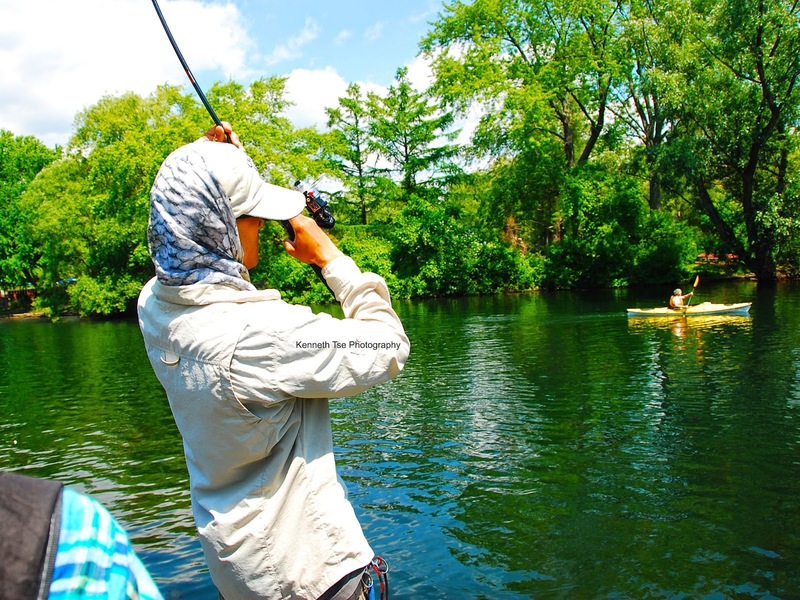 The rod was simply to soft to hold the fish while I try guide the head into the net. At the end, it was a 20lb class carp. I had a little bit of rod bending fun thanks to him. 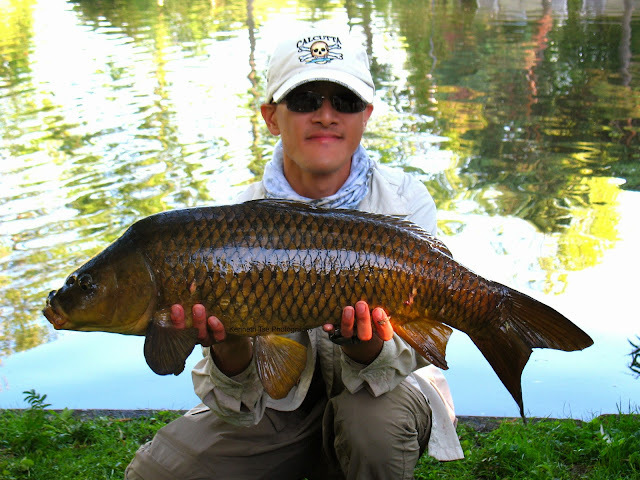 Now I'm really in carp mode. I decided to try a little area where I've caught carp even when they were not very active. 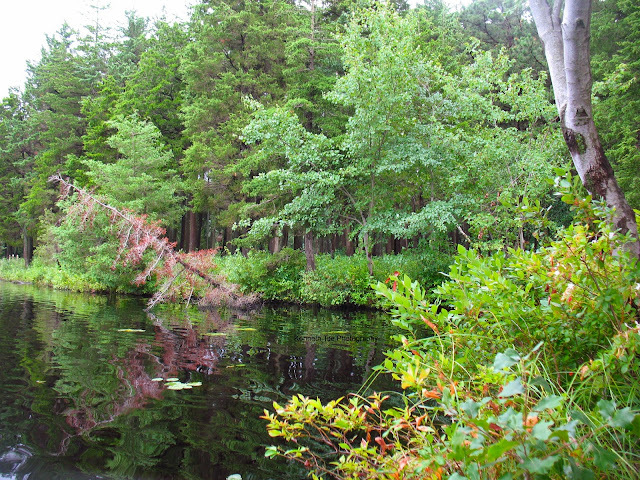 This area is a narrow where carp moved from one basin to the other. At the narrow, there was a dock which I think was what attracted the fish to use this area. Although the water was very shallow, the dock provided some cover as the fish swam through. I placed my rig at the tip of the dock and chummed the area a bit. Twice I had fish came close but just not finding the baited area. Just as I was not watching (the sun's glare prevented me from seeing carp approaching from the other direction), my line went tight and it was on! Although this spot often produce fish, it was extremely difficult landing them. First, there was the dock which fish could run under. Right across the dock was a lot of downed branches that fish could wrap the line around. if the fish ran too far, it could run around the left corner and tangle my line without any means for me to chase the fish. If the fish ran to the right, there was another set of docks that could foul the line. 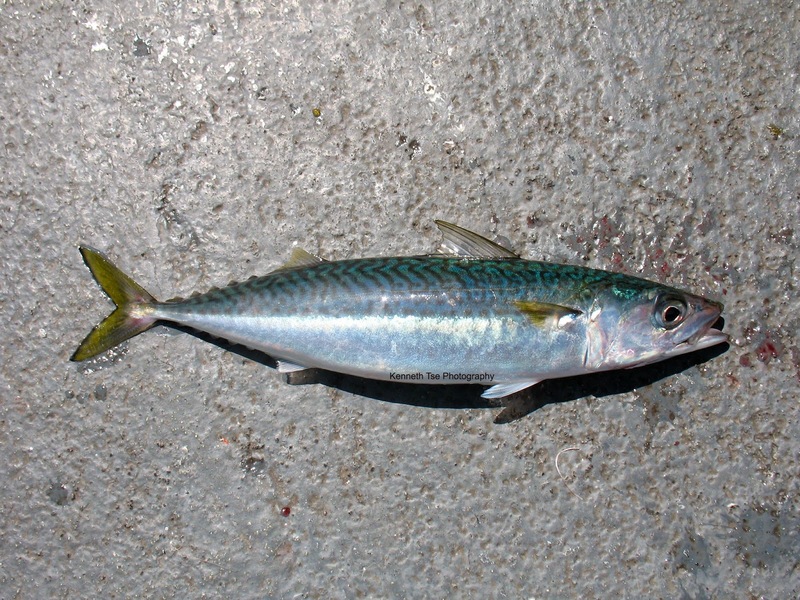 It was close quarter combat fishing...you either stop them quickly or it is game over. Well, I did stop the fish early enough and I had it pretty beat. But just as I was getting ready to land it, it gave a turn and got into the fallen branches. The line was wrapped around a pretty big branch and it was game over for me. The fish eventually pulled the hook out. People started leaving due to the slow carp action. Eventually, the young guy left too. He came by to thank me again for the help and told me he just lost another fish before he packed up. I know his spot is a great spot since there is an overhanging willow tree where carp came into the feed in very shallow water. I've seen them come into that area numerous times in the past. I tossed in my rig just to the edge of the overhanging willow and baited the area. Within less than 5min, I was on! There wasn't any drama with this fish this time. It wasn't a big carp and it was under control the whole time. But that was all the action this spot gave up. After 30min, I decided to call it a day since it was already 7pm. I had already taken apart all my gear when I was walking along the shore and spotted a trio of carp feeding very tight to the shore. I simply can't resist. I had been trying to sightfish for carp all day while searching for Bowfin. I came across a few fish in the shallows, but even a gentle drop of the worm in their feeding path spooked them. 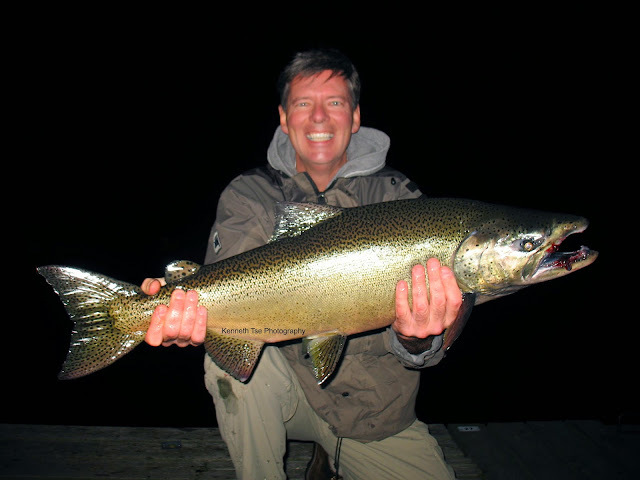 This time, it was no different and the fish ran back to deeper water. But as I watched, I could see them returning to the shallows again. Instead of placing the worm close to them, I watched for their direction of travel and placed the worm 15 feet ahead of their path. It took quite a bit of patience waiting for them to approach, since they were working the bottom very methodically and thoroughly searching for any edible items. At one point, the trio turned for deeper water when someone approached the shoreline (I hate when you are fishing and someone spooked the fish!). But then the fish returned and headed straight for the area where my worm was sitting. Since the worm was sitting under a ledge out of sight, I had to make sure the fish had my bait before setting the hook. I couldn't see any twitch on the line...and then the carp was turning away. But as the fish turned further, I could see my line tightening up. Yep, got it! After this fish, I decided to call it a day. Not a bad day's work with 3 Bowfin and 2 Common Carp!